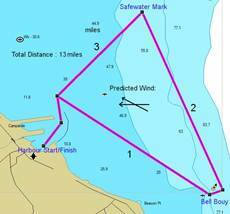 Although a pursuit race, finish times will be taken by the RO in order to calculate an elapsed time to be used for Bart’s Bash. The course distance is 13 Miles. If start time needs to change due to shipping it will be announced at 9:30 and will be published on the white board. Starting sequence will commence at 9:55. After the first start, only a sound signal will be given for the next handicap as start. See Table Below. Each skipper must write their vessels name on the white board prior to race or make sure the race officer records it. Start / Finish Line: This will be between the Starboard Lateral mark of the Yacht basin breakwater and the Port lateral mark of the ore quay. Any changes to start/finish will be announced at 9:30 and will be published on the white board. 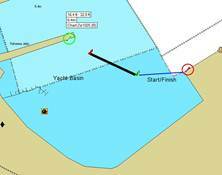 Course: Start -> Bell-Buoy to Port -> PE Safe water mark to Port -> Harbour finish. Any changes to course will be announced at 9:30 and will be published on the white board.